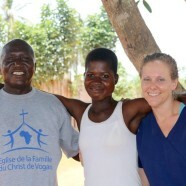 Home » Togo » Healing, Trials, and Thanksgiving! We are so excited to write to you again concerning Helen. 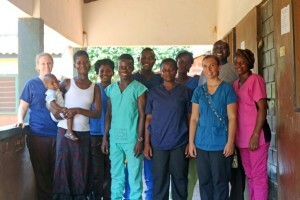 Helen has just recently finished her second surgery sponsored through Togo Christian Mission after a severe tooth abscess and is recovering amazingly! We praise God as prior to the second surgery she was having a large pocket of infection that was very concerning. This time they have removed the infected tissue and bone and it has healed over. This morning we removed the last of the stitches and so far, see no signs of infection. Praise God! We are so thankful for you, our partners who helped us financially for this to become a reality! Helen’s wound healed after her second surgery! But through all this time God is accomplishing something much greater through all of this. Helen has become a good friend and has since started growing in her faith as well. Since her coming to Vogan for care she has started fellowshipping with us at the Vogan Church. During her sicknesses and surgeries there were many times where she would become discouraged as it was not easy due to a lot of intense pain after surgeries and patience while the wounds were healing. However, this was more time for us to show Christ’s love to her. She continues to be receptive and faithful in learning more about Christ and gives Him the glory for healing her. But more than that, her husband is now also acknowledging the power of Christ to heal. Her husband is an idol worshiper who is 2nd in charge of the idol priest in their area. During years of trials of having such a severe tooth abscess and even during this current process they have not felt the love or support of their fellow idol worshipers. In fact, they have often been treated harshly because of it. Now he has told us he has seen the care and love that we have shown to them, and he is starting to see how the love of Christ calls us to love others. He says he does not want to worship idols anymore and is actually looking to move out of their current village to be away from those influences. Praise God! Please pray with us that he and his wife are able to get a fresh start as they seek to honor God. The past few months have also been a very challenging time. In January and February, we had two separate fires that were set on the farm area. 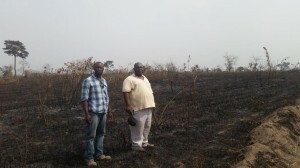 The first time, a man went into our farm with matches and intentionally set the fire. 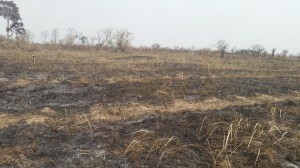 It burned a section of around 1000 trees that were planted there, but thankfully we were able to get it extinguished before it went to other sections of the farm. The person who lit the fire eventually admitted it to the police. He is an avid drinker and is often found causing a lot of problems in the village there. The police determined that he would have to pay the damages, but when the day came for him to pay for the damages he ran away and has not been seen since. In February, the man who owns the land beside us set fire on his farm to burn down the brush before planting season starts. It is dry season yet and this is a common practice for them to prepare their fields before planting. One of our farm workers noticed the flames and went and asked them please to be checking the fire so that it does not spread to our land as we do not practice brush fires on our land. The workers said they would be careful. Shortly after, our farm worker noticed the smoke looking higher and went to check and it had started burning on the further portion of our land. They were not able to get the fire out before it had destroyed almost 2,300 fruit trees that we have planted this past year, some with help from groups from Texas and Tennessee. In order for the fire to get where it did it would have to pass over a large section of our land that had no fire damage and it did not burn other farms that were also downwind of the fire. This causes a lot of suspicion that it was intentionally set as well. The police have done an investigation and now it remains to go to the courts for their decision on the case. Please pray that truth would be shown here. Also, there has been a project that has been going on since this past fall in order to dig a pond at the farm that would be able to serve as a source of water during dry season, help direct the increased water we see on our land during rainy season, and allow us to raise fish in the future. We were so thankful for those who contributed towards this project financially as well as William Sawyer and Andre Houssney coming out to the site to help us plan and create a plan that would work great for the pond. We found a local engineer who could help us oversee the pond digging and would bring the bulldozer down for the work. When they came, he helped create a path around the farm and cleared the area where the pond was to be dug but was not moving forward in actually digging the pond. This has led to yet another court case as he did not complete the work prior to removing the bulldozer. Thankfully he only had a partial advance for the required work but since he did not complete what he said we would complete we have taken the case to the courts. Please pray with us that truth would be evident and for wisdom for all involved in this case. Lastly, we have had an issue with transportation as of late. The farm truck was having extensive motor issues but our mechanic advised us he could rebuild it and did so. After about two weeks however, the engine had major issues to the point where it could not be driven again. We have since had to replace the engine. This had put us without transportation at a time where we desperately need to be mobile with work going on at the farm, court cases, clinic work, and general ministry. We had $7,200 raised to put towards a family vehicle but ended up having to spend $5000 of that on truck repairs and motor replacement. Praise God the truck now has a new engine and is running well. However, please pray with us for provision for a family vehicle as well, as a family where we both do outreach it is limiting. “This is my Father’s world. Praise Him that He is the ruler and that the wrong cannot overcome! We are thankful for a Father that always sees our hearts and the truth that lies within. 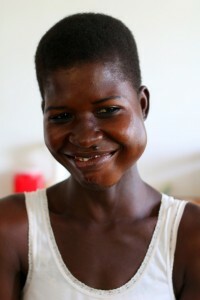 Helen’s family taking huge steps of faith in following after Christ after her surgery! For the physical healing that has been brought to her! Our landlord fixed our roof that was leaking and causing mold issues in our (Dovene and Sara’s) house. We thank God that he has finally fixed this after almost of year! I think this may have been a partial cause to so many of our sicknesses the past year, so we praise God that it is fixed and we are in good health. Please pray for the fire court case as well as the pond digging court cases. Please pray for truth and justice with us. We will be hosting a team in April from Park Avenue Church of Christ who will come back to do Cataract surgeries and work with the local people with their eye issues. Please for the Doctors (Dr. Clay who will be returning for second time with us and Dr. Burlingame who will be here for the first time with us) and Volunteers coming that God would lead them and guide them. Please pray for the people who they will work with to be open to the gospel and see Christ’s light through this. If you would like to sign up to receive our monthly updates with prayer points you may do so HERE.